Anaplasma phagocytophila, the etiologic agent of human granulocytic ehrlichiosis, is an emerging bacterial pathogen that invades neutrophils and can be cultivated in HL-60 cells. 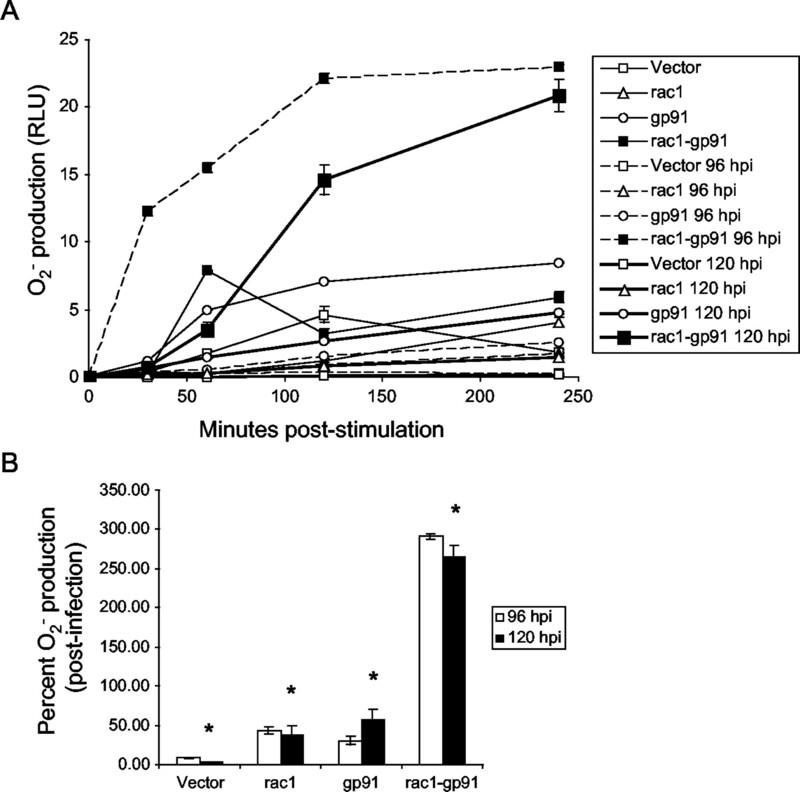 Infected neutrophils and HL-60 cells fail to produce superoxide anion (O2−), which is partially attributable to the fact that A. phagocytophila inhibits transcription of gp91phox, an integral component of NADPH oxidase. cDNA microarray and RT-PCR analyses demonstrated that transcription of the gene encoding Rac2, a key component in NADPH oxidase activation, was down-regulated in infected HL-60 cells. Quantitative RT-PCR demonstrated that rac2 mRNA expression was reduced 7-fold in retinoic acid-differentiated HL-60 cells and 50-fold in neutrophils following A. phagocytophila infection. Rac2 protein expression was absent in infected HL-60 cells. Rac1 and Rac2 are interchangeable in their abilities to activate NADPH oxidase. HL-60 cells transfected to express myc-tagged rac1 and gp91phox from the CMV immediate early promoter maintained the ability to generate O2− 120 h postinfection. A. phagocytophila proliferation was severely inhibited in these cells. These results directly attribute the inhibition of rac2 and gp91phox transcription to the loss of NADPH oxidase activity in A. phagocytophila-infected cells and demonstrate its importance to bacterial intracellular survival. Human granulocytic ehrlichiosis (HGE)3 is an emerging tick-transmitted infection in the United States and Europe (1, 2). The etiologic agent of HGE, recently renamed Anaplasma phagocytophila (3), is an obligatory intracellular bacterium with a tropism for polymorphonuclear leukocytes (PMN; neutrophils). Patients suffering from HGE typically present with multiple nonspecific symptoms, such as fever, headache, myalgia, leukopenia, thrombocytopenia, and elevated hepatic transaminases. The cardinal manifestation of the disease, however, is the infection of neutrophils (1, 2). Neutrophils represent one of the first lines of defense against microbial pathogens. Neutrophils kill and degrade phagocytosed bacteria by generating toxic oxygen intermediates derived from superoxide anion (O2−), including hydrogen peroxide and hypochlorous acid, within the phagosome. O2− is produced by the rapidly activatable NADPH oxidase complex (4, 5, 6). Because of the highly toxic products it generates, activation of NADPH oxidase must be tightly controlled. In resting neutrophils, the oxidase is inactive, and its unassembled components are localized in different parts of the cell (5, 6). The membrane-bound cytochrome b558, the catalytic component of the oxidase, is comprised of two tightly associated subunits, gp91phox and p22phox (7). Three additional components, p40phox, p47phox, and p67phox, are present in the cytosol (4, 5, 8). A critical component of NADPH oxidase is Rac2, a member of the Ras superfamily of GTP-binding proteins (9, 10). In resting neutrophils, Rac2 exists in the cytosol in a GDP-bound state complexed with Rho guanine-nucleotide-dissociation inhibitor (10, 11, 12). Several studies using intact neutrophils (13, 14), differentiated HL-60 cells (15), or cell-free assays (14, 16) have demonstrated that Rac2 essentially serves as the molecular switch for initiating the respiratory burst. Upon activation, Rac2 rapidly converts from a GDP- to GTP-bound state, dissociates from Rho guanine-nucleotide-dissociation inhibitor, and migrates to the membrane (13, 14). Concurrent with Rac2 migration, p40phox, p47phox, and p67phox also localize to the membrane, where they combine with cytochrome b558 (5, 8, 15). Once assembled, NADPH oxidase accepts electrons from NADPH at the cytosolic side of the membrane and donates these to molecular oxygen at the other side of the membrane. The electron transfer reactions within gp91phox are regulated by Rac2 and p67phox (17). This results in the generation of O2− either outside the cell or within the lumen of the phagosome containing ingested micro-organisms (4, 5). Rac2, which constitutes >96% of the Rac in neutrophils (16), is essential to proper NADPH oxidase function. Patients suffering from an immunodeficiency syndrome due to nonfunctional Rac2 have neutrophils impaired in the ability to generate O2− (18). These individuals are predisposed to poor wound healing and life-threatening bacterial infections. Additionally, rac2−/− mice have neutrophils whose O2− production is reduced 4-fold in response to PMA stimulation (19) and is nearly absent in response to fMLP stimulation (20). These mice are highly susceptible to the opportunistic pathogen, Asperigillus fumigatus (19). A. phagocytophila possesses the unique ability to colonize the antagonistic environment of a neutrophil, which indicates that it has evolved strategies for persisting within such a hostile environment. A. phagocytophila can be propagated in HL-60 cells, a human promyelocytic leukemia cell line that is capable of differentiating into functional granulocytes when induced by the appropriate differentiating agents (21). We have previously demonstrated that HL-60 cells and HL-60 cells differentiated into neutrophils using all-trans-retinoic acid (ATRA) (rHL-60) fail to produce O2− following A. phagocytophila infection, even under conditions of maximal stimulation (22). Mott and Rikihisa (23) extended these studies by confirming that A. phagocytophila inhibits the respiratory burst in human neutrophils. We further showed that this phenomenon was partially attributable to the fact that A. phagocytophila-infected HL-60 cells were deficient in gp91phox mRNA, while levels of p22phox, p47phox, and p67phox transcripts were unchanged. In addition, these cells exhibited reduced levels of gp91phox protein. The inhibition of gp91phox expression by A. phagocytophila was confirmed in vivo using a murine model of granulocytic ehrlichiosis (22). The observation that A. phagocytophila specifically alters gp91phox transcription prompted us to investigate the differential expression profiles of additional host cell genes during granulocytic ehrlichiosis. cDNA microarray and RT-PCR analyses revealed that rac2 is down-regulated during A. phagocytophila infection. The extent to which A. phagocytophila represses rac2 mRNA expression in rHL-60 cells and human PMN was defined by quantitative RT-PCR. Loss of Rac2 protein expression was investigated by Western analysis. Because Rac1 and Rac2 are equally capable of activating NADPH oxidase (10, 12, 18), HL-60 cells were transfected to express Myc-tagged Rac1 and gp91phox, either individually or in concert, from the CMV immediate early (CMVIE) promoter. These cells were assessed for the ability to produce O2− and for intracellular proliferation of bacteria following A. phagocytophila infection. This study provides new insights into the complex, multifactorial mechanisms by which A. phagocytophila inhibits NADPH oxidase activity. HL-60 cells (240 CCL; American Type Culture Collection, Manassas, VA) and HL-60 cells infected with A. phagocytophila (isolate NCH-1) were cultured as previously described (21, 22). To induce granulocytic differentiation, HL-60 cells (1 × 106 cells/ml) were incubated for 6 days with 1 μM ATRA (Sigma-Aldrich, St. Louis, MO) (24). PMNs were prepared from heparinized human blood. Two hundred and eighty milliliters of blood was drawn into five 60-ml syringes, each containing 6 ml of anticoagulant and 12 ml of 6% dextran 70 in 0.9% NaCl. In a hood, syringes were secured upright for 90 min while RBC settled. The white cell-rich supernatant was expressed via plastic tubing into a 50-ml collecting tube on ice. Cells were then sedimented at 300 × g for 10 min at 4°C. Following resuspension in 5 ml of HBSS, the cells were layered onto 4 ml of Ficoll-Paque Plus (Amersham Pharmacia Biotech, Piscataway, NJ) and centrifuged at 466 × g for 30 min at 4°C to yield purified PMN. Total RNA from uninfected or A. phagocytophila-infected (≥95%) cells was isolated using the Totally RNA kit (Ambion, Austin, TX), followed by treatment with RNase-free DNase (1 U/500 μg; Roche Molecular Biochemicals, Indianapolis, IN) for 2 h at 37°C. DNA-free RNA was extracted using phenol-chloroform-isoamyl alcohol (25/24/1) (Ambion), ethanol-precipitated, and resuspended in RNase-free water (Ambion). cDNA stocks (50 μl) were prepared from 5 μg of total RNA using random hexamers and the ProSTAR First Strand RT-PCR kit (Stratagene, La Jolla, CA), followed by PCR amplification using 1 μl of cDNA template. The thermal cycling conditions used were 94°C for 2 min, followed by 35 cycles of 94°C for 60 s, 55°C for 60 s, 72°C for 60 s, and a final extension step of 72°C for 7 min. The reaction mixture contained final concentrations of 1.5 mM MgCl2, 200 μM dNTP, 0.8 μM of each primer, and 2.5 U of Taq polymerase (Roche Molecular Biochemicals). To ensure that RNA templates were free from contaminating DNA, identical RT-PCR reactions were performed in the absence of reverse transcriptase (data not shown). The primers used are listed in Table I⇓. Five micrograms of total RNA isolated from either uninfected or A. phagocytophila-infected (≥95%) HL-60 cells was converted to radiolabeled cDNA using [α-32P]dATP and the Atlas Pure Labeling System (Clontech, Palo Alto, CA), and was purified using Chromaspin-200 columns (Clontech). The 32P-labeled cDNAs were hybridized to Clontech’s hematology and immunology arrays. The arrays were exposed to x-ray film at −70°C with intensifying screens, scanned, and analyzed using the AtlasImage 1.01 software package (Clontech). cDNAs generated from uninfected and A. phagocytophila-infected rHL-60 cells or human neutrophils were used as template for quantitative PCR using the iCycler Real Time Detection System (Bio-Rad, Richmond, CA). Each cDNA was in a reaction mixture that contained final concentrations of 1× Platinum Quantitative PCR Supermix-UDG buffer (1.5 U of Platinum Taq DNA polymerase, 20 mM Tris-HCl (pH 8.4), 50 mM KCl, 3 mM MgCl2, 200 μM dGTP, 200 μM dATP, 200 μM dCTP, 400 μM dUTP, and 1 U of uracil DNA glycosylase; Life Technologies, Gaithersburg, MD); 500 nM of each primer; and 200 nM TaqMan probe. β-Actin expression was determined using the TaqMan β-Actin Control kit (PerkinElmer, Foster City, CA). The quantity of rac2 cDNA per sample was determined using normalized cDNA template and the conditions described above, except that the primers and probe targeting rac2 were used at concentrations of 900 and 50 nM, respectively. The sequences of the rac2 primers and probe are listed in Table I⇑. The rac2 TaqMan probe was labeled at its 5′ end with FAM and at its 3′ end with TAMRA. The thermal cycling conditions included 50°C for 3 min, 95°C for 10 min, followed by 40 cycles of amplification at 95°C for 15 s and 60°C for 1 min. Fluorescence detection of FAM was reported at the end of each cycle. The quantity of rac2 cDNA in each sample was correlated to the cycle at which FAM fluorescence above a baseline signal was first detected (cycle threshold value (Ct)). To correct for differences in cDNA template between individual samples, each reaction was performed in triplicate, and the mean Ct was determined. Purified PCR product corresponding to the full coding sequence of rac2 was serially diluted from 1 × 10−1 to 1 × 10−6 ng and was used as a template to construct a standard curve. The iCylcer 2.1 software package (Bio-Rad) generated a standard calibration curve of Ct vs the known quantities of rac2 reference DNA to interpolate the starting quantity of rac2 cDNA in each unknown sample. The rac2 reference DNA was generated using the rac2 F2 and rac2 R1 oligonucleotides (listed in Table I⇑), which target the full coding sequence of rac2, and was purified using the Qiaquick PCR Purification kit (Qiagen, Valencia, CA). Whole cell lysates of uninfected or A. phagocytophila-infected HL-60 cells were prepared as follows. Cells (5 × 106) were sedimented by centrifugation at 469 × g and were washed twice with ice-cold PBS. The cells were resuspended in 1 ml of ice-cold lysis buffer (20 mM Tris (pH 8), 1% Triton-X 100, 0.5 M NaCl, 10 mM MgCl2, 5% glycerol, 1 mM Na3VO4, 25 mM DTT, and one dissolved EDTA-free Complete Protease Inhibitor tablet (Roche Molecular Biochemicals)) and passed through a 27.5-gauge needle six times to aid in lysis, followed by centrifugation at 20,800 × g for 5 min at 4°C. The protein concentration of the cleared supernatant was determined using the Bradford assay (25). Fifteen micrograms of each sample was subjected to SDS-PAGE analysis, followed by transfer to Immobilon-P membranes (Millipore, Bedford, MA). Detection of Rac2 was performed using anti-Rac2 Ab (C-11; Santa Cruz Biotechnologies, Santa Cruz, CA), followed by goat anti-rabbit IgG Ab conjugated to HRP (Cell Signaling, Beverly, MA) using the ECL Plus chemiluminescent detection system (Amersham Pharmacia Biotech). The detection of actin was performed in an identical manner using anti-actin Ab (I-19; Santa Cruz Biotechnologies), followed by donkey anti-goat IgG Ab conjugated to HRP (Santa Cruz Biotechnologies). The pIRES vector (Clontech) carries two multicloning sites (MCS), A and B, flanking the encephalomyocarditis virus internal ribosomal entry site (IRES) (26, 27), which allows for translation of two consecutive open reading frames from a bicistronic mRNA. The MCSs and IRES sequence are downstream of the CMVIE promoter, which drives transcription of the two cloned genes. The IRES site is partially disabled, which reduces the translational efficiency of the gene cloned into MCS B (27). pSB949 (28) was used as the source of rac1. 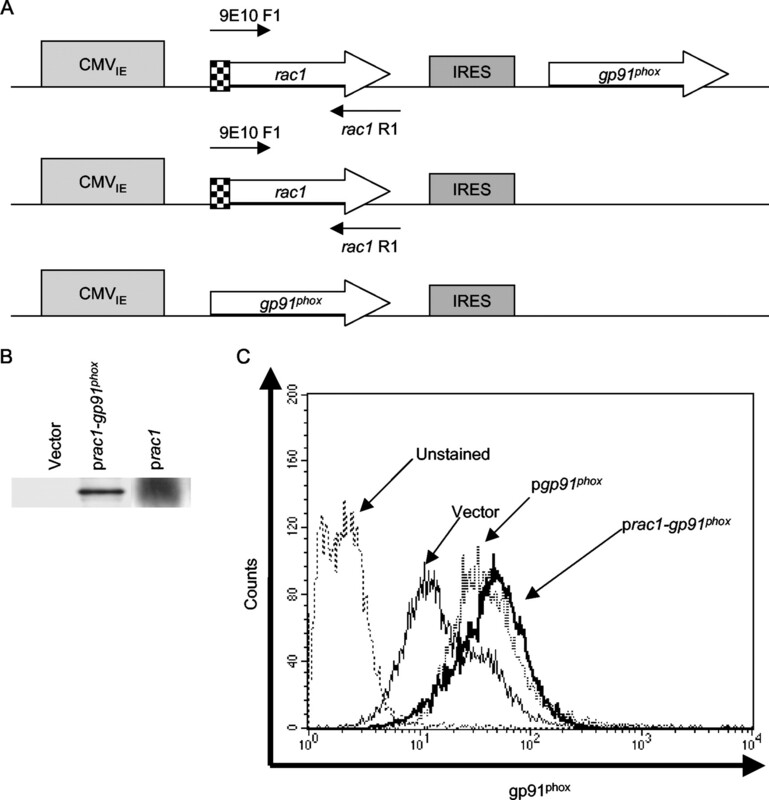 Digestion of pSB949 with EcoRI released a 0.6-kb fragment containing rac1 tagged at its 5′ end with 33 nt encoding the c-Myc epitope recognized by mAb 9E10 (28, 29). The 0.6-kb fragment was ligated into the MCS A EcoRI of the pIRES plasmid. The recombinant plasmid was transformed into competent Escherichia coli JM109 cells (Promega, Madison, WI), recovered using the Qiaprep Spin Miniprep kit (Qiagen), and sequenced to verify the integrity of the sequence and to ensure that the fragment had ligated in the proper orientation. To clone gp91phox into the MCS B NotI site of pIRES, the entire cDNA sequence of gp91phox was RT-PCR-amplified from total RNA isolated from HL-60 cells using primers gp91phox F2 and gp91phox R2 (listed in Table I⇑) and TA-cloned into the pGem T-Easy vector (Promega). The pGem T-Easy vector carries NotI sites that flank both sides of the TA cloning site. gp91phox was subsequently excised as a NotI fragment and ligated into the NotI site of the recombinant pIRES vector already containing myc-tagged rac1. The recombinant plasmid was transformed into JM109 cells, isolated using the EndoFree Plasmid Maxiprep kit (Qiagen), and sequenced to confirm the integrity and proper orientation of the gp91phox insert. HL-60 cells were transfected with 4 μg of either prac1-gp91phox or pIRES vector DNA using 5 μl of DMRIE C (Life Technologies). The transfected cells were transferred to IMDM/20% FBS and incubated at 37°C for 48 h. To select for stable transfectants, the cell culture medium was replaced with medium supplemented with 1.5 mg/ml of G418 (Life Technologies) for 4 wk. Host cell-free A. phagocytophila were liberated from ≥95% infected HL-60 cells by passage six times through a 27.5-gauge needle. Cellular debris was removed by centrifugation at 469 × g. The supernatant was centrifuged at 2135 × g to pellet cell-free bacteria. Each sample of 5 × 105 transfected HL-60 cells was incubated for 30 min at 4°C in 100 μl of IMDM/20% FBS with bacteria that had been liberated from 2 × 106 infected HL-60 cells. This allowed for bacterial binding, but prevented entry. Unbound organisms were removed by washing in sterile PBS, followed by resuspension in 1 ml of IMDM/20% FBS. The suspension was transferred to a single well of a 12-well tissue culture plate and was incubated at 37°C to promote bacterial invasion. Samples of 5 × 105 infected and noninfected control HL-60 cells were washed and resuspended in PBS. The cell suspensions were placed onto glass microscope slides (Carlson Scientific, Peotone, IL), air-dried, and fixed with acetone. The slides were incubated with 50 μg/ml of normal rabbit IgG (BD PharMingen, San Diego, CA) in PBS/0.05% Tween 20/5% FBS for 30 min at room temperature to block nonspecific binding. The blocking solution was removed, and the slides were incubated with rabbit polyclonal anti-A. phagocytophila antiserum (1/500) in PBS/0.05% Tween 20/1% FBS for 30 min at room temperature. The slides were washed three times with PBS/0.05% Tween 20, followed by incubation with FITC-conjugated goat anti-rabbit IgG (1/1000) (Sigma-Aldrich) in PBS/0.05% Tween 20/1% FBS for 30 min at room temperature. The slides were again washed, mounted with coverslips using Gel/Mount (Biomeda, Foster City, CA) mounting medium, and analyzed. Transfected HL-60 cells (5 × 105) were incubated in PBS/0.5% FBS for 30 min on ice with primary Abs (either mAb 7D5 (3 μg/ml) or IgG1 isotype control). To block nonspecific binding, 50 μg/ml of mouse IgG1 (BD PharMingen) was added to each sample in conjunction with primary Ab. The cells were washed with PBS/0.5% FBS and incubated for 30 min on ice with biotin-conjugated anti-mouse IgG1 (2 μg/ml; BD PharMingen). The cells were washed and incubated for 30 min on ice with streptavidin-conjugated CyChrome (2 μg/ml; BD PharMingen). The cells were washed again and resuspended in 0.5 ml of PBS/0.5% FBS/0.5% paraformaldehyde (v/v). All analyses were performed using a FACSCalibur (BD Biosciences, Mountain View, CA). The data presented were generated using CellQuest software (BD Biosciences). Superoxide production by A. phagocytophila-infected cells was performed as previously described (22), except that phorbol 12,13-didecanoate (PDD; Sigma-Aldrich; 200 ng/ml) was used as an activator of NADPH oxidase. Uninfected and A. phagocytophila-infected transfectants were incubated for equivalent lengths of time before PDD stimulation. We have previously reported that A. phagocytophila exploits host cell gene expression as a means of facilitating its intracellular survival and dissemination (22, 30). We therefore sought to identify additional host cells genes whose differential expression may provide a selective advantage for A. phagocytophila. Total RNA from uninfected HL-60 and A. phagocytophila-infected (≥95%) HL-60 cells served as template for generating 32P-labeled cDNAs that were used to screen Clontech’s Hematology and Immunology Atlas Array, which carries 450 cDNAs expressed by leukocytes and erythrocytes. This approach identified several cDNAs exhibiting differential hybridization (data not shown). Each cDNA was assigned a numerical score, which reflected the expression level as inferred from hybridization signal intensity (Table II⇓). RT-PCR using cDNA pools that had been normalized to β-actin expression corroborated these results (Fig. 1⇓). Genes that were down-regulated during A. phagocytophila infection were those encoding Rac2 (9, 10), bactericidal membrane permeability-increasing protein (31), c-Myc (32), myeloblastin (33), and, to a lesser extent, myeloperoxidase (34). Genes exhibiting increased levels of expression during infection were those encoding ferritin heavy chain (35), IL-8 (36), and, to a much lesser degree, IL-1β (37). The biological role for each of these proteins is provided in Table II⇓. In addition to β-actin, 13 genes demonstrated equivalent levels of expression (data not shown). RT-PCR analysis was extended to confirm the differential expression of these genes in neutrophil-like rHL-60 cells infected with A. phagocytophila (Fig. 1⇓). With the exception of c-myc, mpo, and mbn, for which either no or very low expression was detectable upon differentiation, the expression profiles remained consistent with those observed for A. phagocytophila-infected HL-60 cells. Differential expression of host genes during A. phagocytophila infection. Total RNA was extracted from 5 × 106 A. phagocytophila-infected (≥95%) HL-60 or rHL-60 cells. Five micrograms of RNA was used as template for cDNA synthesis. One microliter of cDNA served as template for PCR amplification using primers targeting genes that were identified by microarray screening as being differentially expressed during A. phagocytophila infection. One of three independent experiments with similar results is shown. Among the panel of genes differentially expressed during Anaplasma infection, rac2 was the most intriguing. Virtually no rac2 transcript was detected in A. phagocytophila-infected HL-60 cells (Fig. 1⇑). Differentiation of HL-60 cells along the neutrophil lineage with ATRA leads to a severalfold increase in rac2 expression (38). Although rHL-60 cells exhibited a significant increase in rac2 expression, only a low level of rac2 transcript was detectable upon Anaplasma infection. While a low level of rac1 transcript was detected in uninfected rHL-60 cells and neutrophils, this level dropped below that detectable by RT-PCR upon A. phagocytophila infection. This is consistent with a previous observation that Rac2 constitutes >96% of the total Rac in myelocytic cells (16). Accordingly, rac1 expression during A. phagocytophila infection was not investigated further. Because of the critical role Rac2 plays in PMN anti-microbial defense and because no other pathogen has been demonstrated to inhibit its expression, we further investigated the relevance of rac2 down-regulation to A. phagocytophila infection. To define the extent to which this bacterium inhibits rac2 transcription, rHL-60 cells and human peripheral blood PMN were infected in vitro with A. phagocytophila and examined for rac2 expression by quantitative RT-PCR. Anaplasma infection of each sample was confirmed by the indirect immunofluorescence assay. The mean number of morulae per infected cell averaged 5.4 ± 1.5, respectively, throughout the course of the experiment (data not shown). The mean number of morulae per infected PMN averaged 5.7 ± 0.4, respectively. As presented in Table III⇓, rac2 expression by Anaplasma-infected rHL-60 cells was decreased nearly 7-fold at 48 h postinfection (hpi). Anaplasma-infected PMNs exhibited a 50-fold reduction in rac2 mRNA 24 hpi. The observed loss of rac2 expression was directly attributable to viable A. phagocytophila, as incubation with heat-killed bacteria for equivalent lengths of time had no detrimental effect on rac2 mRNA levels (data not shown). To ensure that the loss of rac2 transcription was not due to host cell death, all cell populations were examined by the trypan blue exclusion assay. With the exception of Anaplasma-infected PMN 48 hpi, cell viability remained ≥95% for each population (data not shown). At 48 hpi, nearly all the infected PMN were lysed, thereby excluding the population from being assayed. Also, the transcriptional activity of each sample was confirmed by assessing β-actin expression, thereby ensuring that loss of rac2 mRNA was not the consequence of a global effect of Anaplasma infection on transcription. 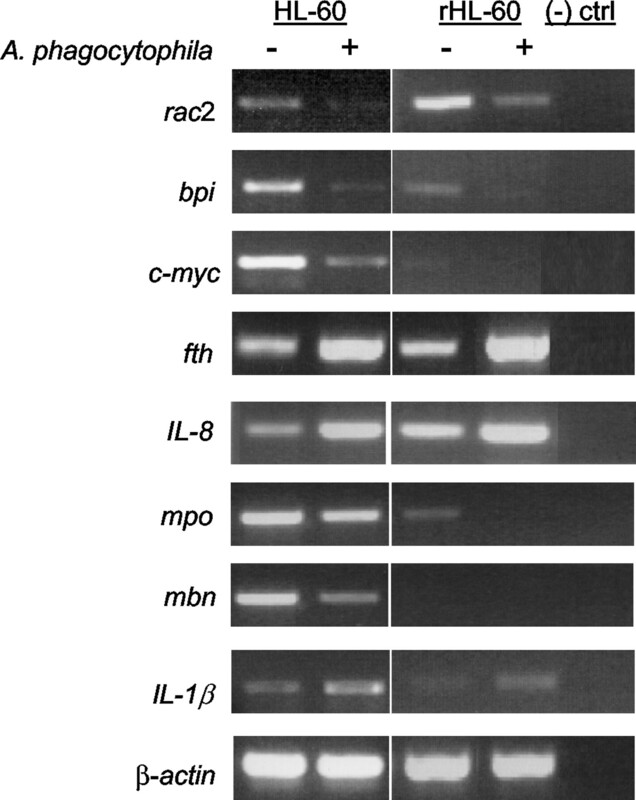 To examine whether the loss of rac2 transcript during A. phagocytophila infection translates to a loss of Rac2 protein, Western immunoblot analysis was performed. As depicted in Fig. 2⇓, the Rac2 protein level of A. phagocytophila-infected HL-60 cells was drastically reduced 48 hpi compared with that in uninfected control cells. Ab directed against actin was used as a control to ensure equal protein loading between samples. A. phagocytophila infection results in loss of Rac2 protein expression. HL-60 cells (5 × 106) were infected with host cell-free A. phagocytophila (liberated from 1 × 107 ≥95% infected HL-60 cells) for 48 h. Whole cell lysates (15 μg) were subjected to SDS-PAGE, followed by Western immunoblot analysis using Abs against Rac2 and actin. Results shown are representative of five independent experiments. We have previously reported that A. phagocytophila inhibits gp91phox mRNA expression (22) and in this study present evidence of repression of rac2 transcription. Therefore, to directly assess the importance of the down-regulation of these two genes by A. phagocytophila, HL-60 cells were stably transfected with prac1, pgp91phox, or prac1-gp91phox, which express rac1, gp91phox, or rac1 and gp91phox, respectively, from the CMVIE promoter. It is well established that Rac1 and Rac2 are interchangeable in their abilities to activate NADPH oxidase (10, 12, 18). Thus, it is feasible to use Rac1 to compensate for the loss of Rac2 experienced during A. phagocytophila infection. Since the expression of recombinant rac1 and gp91phox is not driven from their native promoters, it follows that A. phagocytophila would be unable to exert its repressive effects on their transcription. The construction of and the expression system used by each of these vectors are described in Materials and Methods, and a schematic is presented in Fig. 3⇓A. The rac1 gene carried by prac1-gp91phox is tagged at its 5′ end with the nucleotide sequence encoding the c-Myc epitope recognized by mAb 9E10 (28, 29). This allowed for differentiation between Rac1 expressed from the CMVIE promoter and endogenously expressed Rac. Integration of recombinant rac1 into the HL-60 genome was confirmed by PCR using primers that exclusively amplified the myc-tagged gene (data not shown). Myc-tagged Rac1 protein expression was verified by immunoblot analysis using mAb 9E10 (Fig. 3⇓B). Recombinant gp91phox expression by pgp91phox- and prac1-gp91phox-transfected cells was confirmed by flow cytometry using mAb 7D5 (39), which recognizes a surface-exposed epitope of gp91phox (40). As shown in Fig. 3⇓C, pgp91phox- and prac1-gp91phox-transfected cells expressed considerably higher levels of gp91phox protein than cells transfected with vector carrying no insert DNA. The gp91phox mean fluorescence intensities were 28.98 ± 2.04 for vector control cells, 53.42 ± 0.05 for pgp91phox-transfected cells, and 51.53 ± 0.03 for prac1-gp91phox-transfected cells. Stable expression of recombinant Rac1 and gp91phox from HL-60 cells transfected with prac1, pgp91phox, and prac1-gp91phox. A, Schematic representation of the plasmids. Cloned rac1 and gp91phox are represented by thick arrows. The checkered box at the 5′ end of rac1 depicts the c-myc tag. The binding sites of PCR primers 9E10 F1 and rac1 R1 are indicated by thin arrows. The CMVIE promoter and IRES are presented as shaded boxes. B, Confirmation of the expression of Myc-tagged Rac1 by prac1 and prac1-gp91phox-transfected HL-60 cells. Whole cell lysates (15 μg) of vector- and prac1-gp91phox-transfected HL-60 cells were subjected to SDS-PAGE, followed by Western immunoblot analysis using mAb 9E10. Results presented are representative for three independent experiments with similar results. C, pgp91phox- and prac1-gp91phox-transfected HL-60 cells exhibit increased gp91phox protein expression. Vector-, pgp91phox-, and prac1-gp91phox-transfected HL-60 cells (5 × 105) were probed with mAb 7D5 and examined by flow cytometry. One of five experiments with similar results is shown. HL-60 cells infected with A. phagocytophila fail to produce O2−, even when stimulated with PMA (22). To assess whether prac1-, pgp91phox-, prac1-gp91phox-, or vector control-transfected HL-60 cells maintain the ability to form a functional NADPH oxidase during A. phagocytophila infection, each were incubated with host cell-free bacteria. PDD, which is a more potent activator of NADPH oxidase than PMA, was added, and superoxide production was measured using a luminol-dependent chemiluminescence assay. To determine the percentage of Anaplasma-infected cells and the multiplicity of infection, indirect immunofluorescence assay was performed 2 h following the addition of bacteria. One hundred percent of the cells for each population were infected. The mean numbers of bacteria per cell were 6.21 ± 0.44, 5.98 ± 0.54, 6.27 ± 0.43, and 6.08 ± 0.11 for prac1-, pgp91phox-, prac1-gp91phox-, and vector control-transfected cells, respectively. None of the populations produced significant amounts of O2− in the absence of PDD (data not shown). Consistent with previous observations (22, 23), A. phagocytophila infection alone did not elicit O2− production. Following the addition of PDD, superoxide generation by vector control-transfected cells reached a maximum of 4.60 ± 0.59 relative luminometer units (RLU) (Fig. 4⇓A). A similar value was observed for nontransfected HL-60 cells (data not shown). Superoxide production by prac1 transfectants reached a maximum of 4.07 ± 0.32 RLU. Cells transfected with pgp91phox produced a maximum of 8.48 ± 0.33 RLU. Superoxide production by prac1-gp91phox transfectants reached a maximal value of 7.88 ± 0.04 RLU. As gp91phox mediates the electron transfer reactions to molecular oxygen to generate O2− (7), the increase in superoxide production by pgp91phox-and prac1-gp91phox-transfected cells is not surprising and supports the idea that the proteins expressed from the CMV promoter function properly. Reconstitution of NADPH oxidase activity during A. phagocytophila infection of prac1-gp91phox-transfected HL-60 cells. Vector-, prac1-, pgp91phox-, or prac1-gp91phox-transfected HL-60 cells (5 × 105) were incubated with host cell-free A. phagocytophila (liberated from 2 × 106 ≥95% infected HL-60 cells). At 96 and 120 hpi, NADPH oxidase activity was stimulated by the addition of PDD, and superoxide anion production (in RLU) was recorded at 0, 30, 60, 120, and 240 min poststimulation. RLU values are the mean ± SD of three measurements. B, Percent O2− production following A. phagocytophila infection. The maximum RLU value for each infected sample (determined in A) was divided by the maximum RLU value for the corresponding uninfected sample and multiplied by 100. ∗, Values are statistically significant (by Student’s t test, p < 0.05). Results shown are representative of three independent experiments with similar results. PDD-stimulated, A. phagocytophila-infected vector control cells produced maximal RLU values of only 0.38 ± 0.01 at 96 hpi and 0.14 ± 0.01 at 120 hpi, representing declines in O2− production of 91.7 and 97%, respectively (Fig. 4⇑B). A. phagocytophila infection of prac1-transfected cells resulted in reductions in PDD-stimulated O2− production of 56.5 and 62.9% following 4 and 5 days of A. phagocytophila infection, respectively. Superoxide production by pgp91phox-transfected cells was reduced by 69.5 and 43.7% at 96 and 120 hpi, respectively. NADPH oxidase activation by prac1-gp91phox-transfected cells was not inhibited. In fact, these cells exhibited a 291% increase in superoxide production 96 hpi, producing a maximum of 22.94 ± 0.26 RLU. Superoxide production remained high 120 hpi, reaching a maximal value of 20.86 ± 1.15 RLU. The observation that cells transfected to express Rac1, gp91phox, or both proteins produced considerably more O2− than vector control-transfected cells following infection indicates that A. phagocytophila had no inhibitory effect on transgene expression. This was confirmed by Western immunoblot and flow cytometric analyses (data not shown). Transfectants incubated for comparable lengths of time with heat-killed A. phagocytophila exhibited no reduction in O2− production. Since the A. phagocytophila used in this assay were liberated from infected HL-60 cells, the transfected cells were incubated with HL-60 cell lysate to ensure that this had no inhibitory effect on O2− release (data not shown). Before being monitored for O2− production, each sample was examined for viability by trypan blue exclusion and was counted in a hemocytometer to ensure that all assays were performed using equivalent numbers of viable cells. These data demonstrate that reconstitution of both Rac and gp91phox expression is necessary to restore the functional capacity of NADPH oxidase during A. phagocytophila infection. Because only the HL-60 cells transfected to express both Rac1 and gp91phox retained the ability to generate a strong respiratory burst during granulocytic ehrlichiosis, we next investigated the permissivity of these cells to the intracellular survival of A. phagocytophila. prac1-gp91phox-transfected and vector control-transfected HL-60 cells were incubated with host cell-free A. phagocytophila. Indirect immunofluorescence assay examination revealed that the mean number of bacteria bound per cell was nearly equivalent for both sets of transfectants (Fig. 5⇓A). However, beginning 24 hpi the mean number of bacteria per cell was significantly lower (p < 0.005) for prac1-gp91phox-transfected cells compared with vector control cells. These data suggest that A. phagocytophila was not able to proliferate within cells in which it was unable to repress rac and gp91phox expression. Reconstitution of Rac and gp91phox expression inhibits A. phagocytophila proliferation. Vector- or prac1-gp91phox-transfected HL-60 cells were incubated with host cell-free A. phagocytophila and monitored for bacterial proliferation. A, Immunofluorescent detection of A. phagocytophila in vector- and prac1-gp91phox-transfected cells at the indicated times postinfection. The mean number of morulae per cell, as determined by indirect immunofluorescence assay, is presented for vector control cells (□) and prac1-gp91phox-transfected cells (▪). At least 200 individual cells were counted per sample per time point. The values presented are the mean ± SD of three independent countings. ∗, Values are statistically significant (by Student’s t test, p < 0.005). B, RT-PCR detection of A. phagocytophila 16S gene mRNA expression. Total RNA was isolated from infected vector- and prac1-gp91phox-transfected cells at the indicated time points and converted to cDNA. One microliter of cDNA was subjected to PCR using primer sets targeting the A. phagocytophila 16S rRNA gene or human β-actin. The data presented in A and B are representative of three independent experiments with similar results. As an additional means of assessing whether prac1-gp91phox-transfected HL-60 cells are less permissive to Anaplasma intracellular survival, the infection assay was repeated, and RT-PCR was performed using primers targeting the A. phagocytophila 16S rRNA gene. As depicted in Fig. 5⇑B, A. phagocytophila 16S rRNA gene expression in infected control cells remained high throughout the course of infection. In contrast, expression in infected prac1-gp91phox-transfected cells had markedly dropped 24 hpi and continued to decline throughout the time course. These data support the indirect immunofluorescence assay results, thereby confirming that HL-60 cells transfected with prac1-gp91phox are able to inhibit the proliferation of A. phagocytophila. A. phagocytophila is unique in its ability to survive and replicate within neutrophils, the primary effector cells of microbial killing. It is evident that this bacterium employs multiple mechanisms to persist within such a hostile environment. Recent studies by our group indicate that one such strategy is the manipulation of host cell gene expression (22, 30). In the present study we sought to identify additional host cell genes whose differential expression may provide a selective advantage for A. phagocytophila. Analysis of Anaplasma-infected HL-60 cells identified eight differentially expressed genes. With the exception of c-myc, mpo, and mbn, for which little or no transcript was detected following ATRA treatment, the differential expression profiles remained consistent for infected, neutrophil-like rHL-60 cells. It has been reported that mRNA expression for c-myc (41), mpo (42), and mbn (43) by HL-60 cells is severely reduced upon differentiation. Of the genes exhibiting differential expression during A. phagocytophila infection, rac2 and bpi were interesting because of their contributions to the neutrophil anti-bacterial response. BPI is an anti-microbial peptide produced exclusively by PMNs (31). Because of the strong affinity of its amino terminus for LPS, it is selective in its activity against Gram-negative bacteria. Binding of BPI to Gram-negative bacteria results in immediate growth arrest, followed by permeations in the bacterial membrane. The carboxyl terminus of BPI serves as an opsonic factor. Expression of bpi was severely inhibited in Anaplasma-infected cells. Although untreated A. phagocytophila infection has been reported to increase susceptibility to secondary infection (44), it is currently unknown whether this has any correlation with loss of BPI expression. Because of the essential role Rac2 plays in respiratory burst activation and because loss of rac2 transcript probably contributes to the loss of superoxide production, we investigated rac2 down-regulation and its relevance to A. phagocytophila pathogenesis. Infection of HL-60 cells resulted in severe down-regulation of rac2 mRNA expression. Differentiation along the neutrophil lineage, which is normally accompanied by a severalfold increase in rac2 transcript levels (38), only minimally compensated for the loss of rac2 expression. A. phagocytophila rapidly exerts its repressive effect on rac2 expression, as transcript levels were reduced by 85% in rHL-60 cells 48 hpi and by 98% in PMN 24 h following infection. This rapid loss of rac2 message translated into a severe deficiency of Rac2 protein, which would thereby render the host granulocyte incapable of mediating the electron transfer reactions necessary for O2− generation. To survive and replicate within phagocytes, pathogenic micro-organisms have developed an array of mechanisms to avoid or resist exposure to oxidative killing. Many bacteria use superoxide dismutases, catalases, and the recently defined NoxR proteins to neutralize toxic oxygen compounds (45, 46, 47). Other bacterial species avoid exposure to O2−. Salmonella typhimurium, for example, prevents NADPH oxidase assembly by excluding flavocytochrome b558 from the phagosomal membrane (48, 49). Of the many pathogenic species of bacteria that circumvent oxidative killing, A. phagocytophila remains unique in that it specifically represses the mRNA expression of two critical subunits of NADPH oxidase. Although Mycobacterium tuberculosis has been shown to down-regulate the transcription of coxVIIc, which encodes a mitochondrial cytochrome c oxidase, this has not been directly linked to respiratory burst inhibition (50). Because A. phagocytophila infection results in the specific down-regulation of both gp91phox and rac2, it is tempting to speculate that the bacterium may exert its effects on a common factor that is involved in regulating the expression of both genes. The gp91phox promoter and the factors that regulate gp91phox expression have been extensively characterized. Regulation of gp91phox expression has been shown to be a competition between a series of repressor and activator proteins (51). In contrast, the rac2 promoter and transcription factors that may potentially be involved in the regulation of its expression have only been minimally characterized (52). Of the transcription factors linked to gp91phox or rac2 expression, PU.1, a member of the Ets family of activators, is shared. PU.1 plays a prominent role in the activation of gp91phox transcription (53). However, a study by Ou and colleagues (52) suggested that although a recognition site for PU.1 is present in the rac2 promoter, it does not represent a primary factor involved in the regulation of rac2 expression. Thus, a great deal remains to be learned regarding rac2 expression, whether rac2 and gp91phox truly share common transcription factors, and whether A. phagocytophila uses a common strategy for inhibiting the expression of both genes. The reconstitution of NADPH oxidase activity in deficient cell lines using gene transfer methods has been demonstrated to restore the O2−-generating capability of these cells (54, 55). It has been thoroughly proven that Rac1 can substitute for Rac2 in NADPH oxidase activation (10, 12, 18). Therefore, to directly establish the importance of down-regulating the mRNA expression of rac2 and gp91phox to A. phagocytophila pathogenesis, HL-60 cells were transfected to express recombinant Myc-tagged Rac1 and gp91phox, either individually or in concert, from the CMVIE promoter. This allowed for these genes to be transcribed during A. phagocytophila infection and therefore provided an excellent model for studying the effects of NADPH oxidase reconstitution on Anaplasma intracellular survival. A. phagocytophila was unhindered in its ability to enter any of the transfected cells, demonstrating that the transfection procedure did not alter susceptibility to bacterial invasion. A. phagocytophila infection of vector-transfected HL-60 cells resulted in intracellular proliferation of bacteria and nearly complete inhibition of NADPH oxidase activity 96 hpi even in the presence of PDD. Therefore, the course of Anaplasma infection of these cells proceeded normally. HL-60 cells transfected to express either Rac1 or gp91phox were only partially restored in their abilities to generate O2− following A. phagocytophila infection. Since both Rac and gp91phox are required for NADPH oxidase activity, it is not surprising that transgenic expression of only one of these proteins was unable to completely restore the cells’ superoxide-generating capabilities. Rac and gp91phox are both involved in mediating the electron transfer reactions necessary for generating superoxide (7, 17). Furthermore, only a small percentage of the total amount of each NADPH oxidase protein is used for O2− production (4, 5). Therefore, the level of O2− that was produced by prac1 or pgp91phox transfectants following infection was probably due to the combination of the overexpressed transgene and residual endogenous Rac2 or gp91phox. Complete reconstitution of NADPH oxidase severely altered the course of Anaplasma infection. Five days following the addition of bacteria, prac1-gp91phox-transfected cells still generated a strong respiratory burst upon PDD stimulation. Not only was A. phagocytophila proliferation halted, but the majority of bacteria had been killed by 96 hpi, as demonstrated by both indirect immunofluorescence assay and RT-PCR analyses. These data demonstrate that down-regulation of both rac2 and gp91phox expression is integral to A. phagocytophila pathogenesis and intracellular survival. For cells in which NADPH oxidase had been fully reconstituted, superoxide production increased ∼3-fold with Anaplasma infection. This suggests that oxidase activity was stimulated by the presence of Anaplasma. Alternatively, since expression of the recombinant genes from the CMVIE promoter is not regulated, it would be expected that this would lead to accumulation of Rac1 and gp91phox. As these two proteins catalyze the electron transfer reactions, an increase in superoxide production throughout the time course was not surprising. Regardless, the deleterious effect of increased oxidase activity on A. phagocytophila was evident in the consistent reduction of bacterial 16S rRNA gene expression, and this reinforces the essentiality of down-regulating rac2 and gp91phox to Anaplasma intracellular survival. The inhibition of superoxide production by A. phagocytophila is a complex process of which transcriptional repression of NADPH oxidase components represents only one essential part. Mott and Rikihisa (23) demonstrated that 30 min of incubation with A. phagocytophila was able to block 95% of superoxide release by human PMNs. Therefore, before repressing transcription of rac2 and gp91phox once inside the host cell, A. phagocytophila initially inhibits NADPH oxidase activation during invasion. Mott et al. (56) also reported partial degradation of p22phox within 30 min of incubation of bacteria with PMN and 7 days postinfection of HL-60 cells. While degradation of p22phox may contribute to the initial block of NADPH oxidase activity, it certainly is not the sole factor. As only a minor percentage of the total protein of each NADPH oxidase component is used for superoxide generation (4, 5), partial loss of p22phox cannot account for the 95% drop in O2− release. Furthermore, if p22phox degradation were the key factor in NADPH oxidase inhibition, then prac1-gp91phox-transfected HL-60 cells would have been unable to produce O2− following Anaplasma infection. Therefore, the molecular basis of the rapid inhibition of NADPH oxidase activity upon incubation with A. phagocytophila remains to be elucidated. As demonstrated for rac2 in this study and previously for gp91phox (22) and IL-8 (30), A. phagocytophila is able to rapidly alter host PMN transcription to its advantage. Because peripherally circulating neutrophils are terminally differentiated, altering rac2 and gp91phox expression is probably most relevant to the infection of neutrophil progenitor cells in the bone marrow. A. phagocytophila infection of bone marrow progenitors has been demonstrated in vitro (57) and in vivo in patients suffering from HGE (58, 59) as well as in experimentally infected mice (60) and monkeys (61). Therefore, we speculate that A. phagocytophila initially invades peripherally circulating PMNs and are carried to the bone marrow, where they egress and infect neutrophil progenitors. As the infected cells differentiate in the bone marrow, Anaplasma inhibits rac2 and gp91phox expression, thereby leading to the generation of a NADPH oxidase-deficient neutrophil. It is becoming increasingly apparent that A. phagocytophila employs multiple strategies to subvert and exploit the natural functions of its host neutrophil. This study directly demonstrates that down-regulating the expression of two critical subunits of NADPH oxidase, rac2 and gp91phox, is essential to Anaplasma pathogenesis and provides initial evidence that modification of additional host cell genes is also involved. Dissection of the mechanisms responsible for the inhibition of rac2 and gp91phox transcription represents ongoing efforts by our group. These studies as well as those defining the significance of the other differentially expressed genes identified in this report will provide further insight into the molecular pathogenesis of this unique pathogen. We thank Sylvie DeMartino and Rita Palmazorra for technical assistance; Venetta Thomas, Nandhini Ramamoorthi, Juan Anguita, and Li Mei Chen for helpful discussions; and Richard T. Marconi for critical review of this manuscript. ↵1 This work was supported by grants from the National Institutes of Health. E.F. is the recipient of a Clinical-Scientist Award in Translational Research from the Burroughs Wellcome Fund. J. G. is supported by Grant GM52543 from the National Institutes of Health. ↵3 Abbreviations used in this paper: HGE, human granulocytic ehrlichiosis; ATRA, all-trans-retinoic acid; CMVIE, CMV immediate early; Ct, threshold cycle; hpi, hours postinfection; IRES, internal ribosome entry site; MCS, multicloning site; O2−, superoxide anion; PDD, phorbol 12,13-didecanoate; pgp91phox, gp91phox promoter; PMN, polymorphonuclear leukocytes; prac1, rac1 promoter; rHL-60, ATRA-treated HL-60; RLU, relative luminometer units. Goodman, J. L., C. Nelson, B. Vitale, J. E. Madigan, J. S. Dumler, T. J. Kurtti, and U. G. Munderloh. 1996. Direct cultivation of the causative agent of human granulocytic ehrlichiosis [published erratum appears in N. Engl. J. Med. 335:361, 1996]. N. Engl. J. Med. 334:209.